Back pain is one of the leading causes of disability, yet most of the people suffering from it do not know that spinal instability is most likely the real cause of the problem! Instead, most patients are given cortisone injections or prescribed pain pills and muscle relaxers to cover up the pain, which only leads to further degeneration and an endless “pain management” cycle. This is because they are only treating the symptoms versus correcting the underlying spinal instability. Comprehensive Prolotherapy can stop this cycle by regenerating the weakened and overstretched soft tissue structures along the spine, alleviating pain and instability once and for all. In fact, back pain is one of the most popular ailments we treat in our clinics every day! Most of our patients are looking to avoid back surgery, or have already had back surgery and absolutely want to avoid another one. Our providers help patients who have been diagnosed with bulging discs, spinal stenosis, degenerative disc disease, spondylolisthesis, failed back surgery syndrome, sciatica, and more. Using the Hackett-Hemwall technique of Prolotherapy, which is what our clinics are specifically known for, these conditions can be treated quickly and safely to give a more desirable pain-relief outcome. If you want to get off the back pain merry-go-round, it’s time for true Prolotherapy! Navigate through the sections below for lots of back pain information or get help from our medical staff now. Diffculty with unsupported sitting and better with supported backrest. Frequent bouts or episodes of symptoms (recurrence, not first episode). Frequent episodes of muscle spasms. Giving way or back giving out, feeling of instability. Greater pain returning to erect position from flexion. History of painful catching or locking during trunk motions. Inability to “hold” a spinal adjustment. Need to frequently crack or pop the back to reduce symptoms. Pain increased with sudden, trivial, or mild movements. Rotational symptoms, different symptoms on different days. Temporary relief with back brace or corset. Worse with sustained postures or a decreased likelihood of reported static position that is not painful. Modified from: Biely S, et al. Clinical instability of the lumbar spine: diagnosis and intervention. Orthopedic Practice. 18;3:06. Table 1. These symptoms can be signs of the following back pain conditions caused by spinal instability that we commonly treat with Prolotherapy. Ninety-five percent of low back pain is located in a six-by-four inch area, the weakest link in the vertebral-pelvis complex. At the end of the spine, four structures connect in a very small space, which happens to be the six-by-four inch area. The fifth lumbar vertebra connects with the base of the sacrum. This is held together by the lumbosacral ligaments. The sacrum is connected on its sides to the ilium and iliac crest. This is held together by the sacroiliac ligaments. 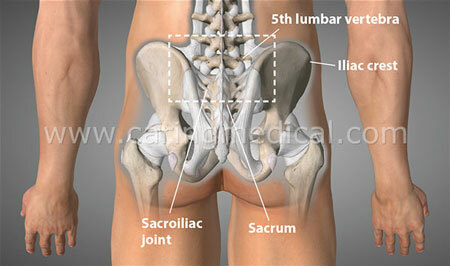 The lumbar vertebrae are held to the iliac crest and ilium by the iliolumbar ligaments. Any time these ligaments are injured or overstretched, it can create spinal instability. This is typically the area treated with Prolotherapy to stimulate ligament repair. Which specific solution to use is determined during the consultation and exam, and can include traditional dextrose, platelet-rich plasma, or stem cells, among other ingredients. Pain in the lower back occurs in the area where the lumbar vertebrae join the sacrum and iliac crest. But what about my MRI? The reason for developing herniated discs, degenerated discs, spondylolisthesis, or other MRI diagnoses is spinal instability. If the instability is not corrected, a patient is more likely to continue on the course of “pain management” and use therapies and pain pills to temporarily calm the pain or get back into alignment. Remember, spinal instability is a progressive disorder, meaning that the area continues to degenerate until regenerative treatments are used to restore the area. As the structures continue to break down, they pinch on nerves and cause pain that can radiate down the legs and into the feet. It indicates that a patient’s referral pain patterns are being elicited. The sacroiliac ligaments refer pain down the posterior thigh and the lateral foot. The sacrotuberous and sacrospinous ligaments refer pain to the heel. The iliolumbar ligament refers pain into the groin area. Iliolumbar ligament sprain should be considered for any unexplained vaginal, testicular, or groin pain. 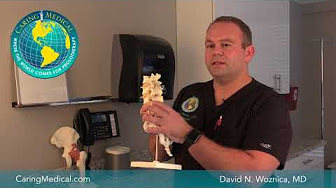 Seeing spinal instability that causes radiating pain is quite common in our practice and, from a Prolotherapists perspective, easy to understand and correct. Ligament laxity can cause localized pain as well as refer pain to distant sites. Our clinics have specialized in helping some of the toughest cases of chronic back pain since 1993. There is not much that we have not seen when it comes to low back pain. The primary advantage of using the Hackett-Hemwall technique with back pain is that it is more comprehensive. It consists of dozens of injections per treatment, versus only 1-10 as done by others performing less aggressive Prolotherapy (including PRP and Stem Cell therapy). We find that this is the most clinically effective and well-researched technique for long-term effectiveness. This is, in part, why patients travel to our clinics for back pain treatment from all around the United States and internationally. Generally, within just a few treatments, the ligament tissue has strengthened enough to better stabilize the spine, therefore, alleviating the pain. 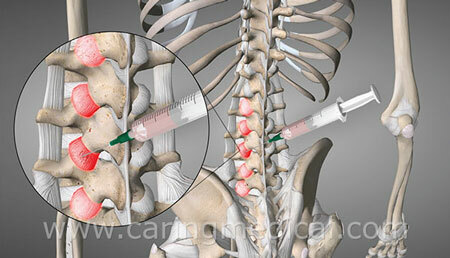 Injured capsular, sacroiliac and other ligaments can be thickened and strengthened with Prolotherapy. In our own published research, 145 patients with chronic low back pain were interviewed an average of 12 months after their last Prolotherapy treatment. These patients, who had been in pain an average of four years and ten months, were treated quarterly with Hackett-Hemwall dextrose Prolotherapy. This included a subset of 55 patients who were told by their medical doctor(s) that there were no other treatment options for their pain and a subset of 26 patients who were told by their doctor(s) that surgery was their only option. In these 145 low backs, average pain levels decreased from 5.6 to 2.7 after Prolotherapy (scale of 1-10); 89% experienced more than 50% pain relief with Prolotherapy; more than 80% showed improvements in walking and exercise ability, anxiety, depression and overall disability; 75% were able to completely stop taking pain medications. The complete study and results can be read here: Hauser R, et al. Dextrose Prolotherapy for unresolved low back pain: a retrospective case series study. Journal of Prolotherapy. 2009;1(3):145-155. We get patient satisfaction results. 97% of patients in this study felt that Prolotherapy changed their life for the better and 94% have since recommended Prolotherapy to someone else. KA was seen by a chiropractor for ringing in the ears. The chiropractor’s high velocity manipulations of her pelvis were too forceful, leaving KA with low back pain and spasms she never had before. After enduring 3 years of pain, KA sought Prolotherapy and received 4 treatments over a 4 month period for instability of the lumbar spine, successfully eliminating the lower back pain, spasms and crepitus. High velocity chiropractic or self-manipulations can cause injuries and instability of the spine. Prolotherapy stabilizes the injured ligamentous structures eliminating pain and symptoms. Despite chiropractic care and numerous allopathic modalities, JR received a multi-level laminectomy for back pain and sciatic symptoms. However, symptoms continued to progress to the point of “crawling on all fours.” MRI revealed multi-level spondylosis, osteoarthritis and degenerative disc disease, and an EMG showed right-sided radiculopathy confirming why pain radiated down the leg. JR received 3 Prolotherapy treatments, significantly improving all symptoms, including the ability to walk normally. Laminectomy is an attempt to stabilize an unstable spine, but it is unsuccessful in treating instability long-term. Prolotherapy is effective post-surgery, but it is an even better treatment choice to stabilize the spine before surgery. 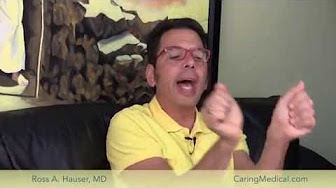 JE came to Caring Medical at age 56 after suffering from chronic low back pain for 3 years. She reported intense pain while sitting in the car or bending forward to pick something up from the floor. JE had seen a physical therapist and chiropractor which gave her temporary relief. She was also treated with Platelet Rich Plasma by a local practitioner, but felt she was not receiving a comprehensive treatment. At Caring Medical, JE underwent 3 rounds of comprehensive Prolotherapy over a period of 3 months. After her last treatment, she reported 100% pain relief and was able to return to full activity! Receiving a PRP injection into the SI joint or any localized area in the low back is not often enough to address all the areas of instability. There are many ligament structures that need to be addressed. Just because a stronger solution is being used, it does not necessarily improve outcomes. 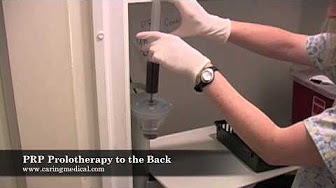 The Hackett-Hemwall injection technique has proven over decades of use in the spine to be one of the safest and most effective Regenerative Medicine treatments available for back pain. TL came to Caring Medical in her 80s to address burning pain in her thigh resulting from what MRIs revealed to be multiple levels of disc herniations in her low back. After being told by several neurosurgeons that nothing could be done to treat her symptoms, TL came to Caring Medical looking for another opinion. She had reached the point where she could not stand for more than 10 minutes without getting intense pain. TL had become nearly immobile, and even trips to the grocery store were too excruciatingly painful for her. After only one treatment with H3 Prolotherapy, TL was able to go grocery shopping and even cooking dinner without experiencing any of the pain she had had prior to receiving treatment. Although TL’s case is not the norm, as most patient’s require more than one treatment, you can see how once the process of Prolotherapy can start to help a person’s quality of life right away. It can make activities of daily living possible again, helping seniors remain more mobile and independent, and enjoy doing more of the things that they love. AL, a 41 year-old physician, suffered for 1.5 years with severe, jabbing, shooting low back pains after a sacroiliac (SI) injury. An MRI revealed a herniated and compressed nerve, for which his neurosurgeon recommended immediate microdiscectomy, followed by physical therapy. AL started to run, kayak and lift weights again, while taking Ibuprofen, and ended up re-injuring his SI. 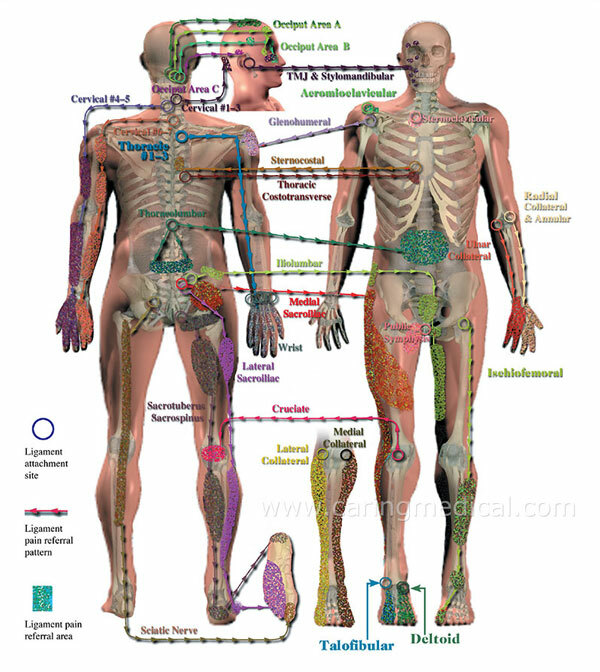 A rhizotomy was performed to deaden the sensory nerves, but the SI degenerated further. Five cortisone injections, acupuncture and osteopathic manipulations brought only minimal relief and AL became “fed up” with the traditional medical options. Difficulty lifting his newborn baby and the struggle to continue working led AL to seek Prolotherapy. After three treatments of Prolotherapy with PRP to the bilateral SI joints, AL improved by over 90%, was able to cease taking pain medications. He began to walk, jog, sprint and hold his baby again, pain-free. The amazing results inspired AL to become a student of Prolotherapy for his own practice! Pain is our body’s way of telling us there is a tissue injury. Cortisone and ibuprofen cover up injury pain and can lead patients to continue training and working just as hard while the joint tissue continues to degenerate. Yet, the patient cannot necessarily “feel” it right away. This, of course, leads to further injury and more pain, and can create a vicious cycle. 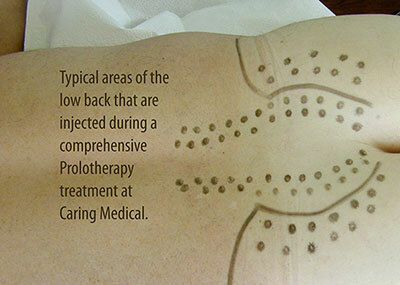 Prolotherapy does not cover up the pain. Rather, it stimulates repair of the joint tissue, giving patients a true sense of how stable the joint is, and allows for the natural use of the joint as it continues to strengthen over the coming weeks and months after treatment. KT developed low back pain in her early thirties and was diagnosed with fibromyalgia. For many years she dealt with her pain only receiving temporary relief from chiropractic adjustments. She came to Caring Medical at age 55 when her chiropractic adjustments were no longer “holding.” She was experiencing almost constant pain in her back which began to refer down both legs. Katie felt her condition was becoming more debilitating with each passing year. She was diagnosed with sacroiliac joint dysfunction and received 4 rounds of Comprehensive Prolotherapy. After her 4th treatment, she reported being “virtually pain-free” and back to a normal life! Spinal instability is often worsened by regular spinal manipulation. The ligaments become like overstretched rubber bands that cannot hold the vertebrae in place and must rely more and more on the muscles, which eventually spasm and create tender trigger points. It is paramount in cases of fibromyalgia and back pain to be evaluated for joint instability and history of trauma, such as whiplash, and possible overmanipulation syndrome from constantly cracking the spine. RV, a 24 year-old, injured his back playing football, but the injury went undiagnosed. Ten years later, he was diagnosed with spondylolisthesis and 2 out of 3 osteopathic surgeons recommended immediate surgery. The constant, diffuse neuropathic low back pain he experienced was exacerbated by lumbar extension and rotation. RV sought regenerative injection therapy as an alternative to back surgery, and after 2 Hackett-Hemwall dextrose Prolotherapy treatments combined with Neural Prolotherapy (Lyftogt Perineural Injection Treatment™), he experienced 100% relief from the nerve pain. In most cases, surgery should be a last resort. Even though surgery may be the only option offered by a surgeon, the patient may be a very good candidate for Prolotherapy when examined by a Prolotherapist who specializes in spinal treatments. A comprehensive treatment various Prolotherapy techniques can effectively resolve neuropathic pain from spondylolisthesis. CG was 85-years-old when she injured her low back during a fall. She suffered immediate, intense pain which was constant while weight-bearing. CG could not walk without the assistance of a walker. Her mobility became severely limited and she struggled to go from sitting to standing. Due to the severity of her pain, she resorted to taking narcotic pain medications daily. Her x-ray showed a compression fracture at L1. However, when she was examined by a specialist here at Caring Medical, this was not the true cause of her pain. Her true cause of pain was soft tissue injury due to sprained ligaments. CG was seen for two rounds of H3 Prolotherapy to her low back a few weeks after her initial injury. After her first treatment, her pain was no longer constant, and she could walk short distances without pain. Following her second treatment, she was able to discontinue her pain medications, walk up a flight of stairs, and no longer required the assistance of a walker. Two years after being seen at Caring Medical, she is still pain-free! Wasting too much time after a fall, or resorting to pain prescriptions, while the patient becomes more disabled can truly have deadly consequences for elderly patients. Immobility in seniors is shown to be more quickly followed by death than in patients who are mobile. One of the best health care providers for seniors is a Prolotherapist because pain after a fall can be addressed right away. Elderly patients who have a positive attitude and are healthy overall can have excellent results with Prolotherapy. How well do you understand the cause of your back pain? Alternatives to Epidural Steroid Injections – Why do patients still get epidurals? How does a woman go in for spinal fusion surgery and come home with pelvic pain? 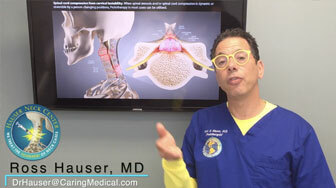 Have you been diagnosed with wear and tear lumbar spondylosis? 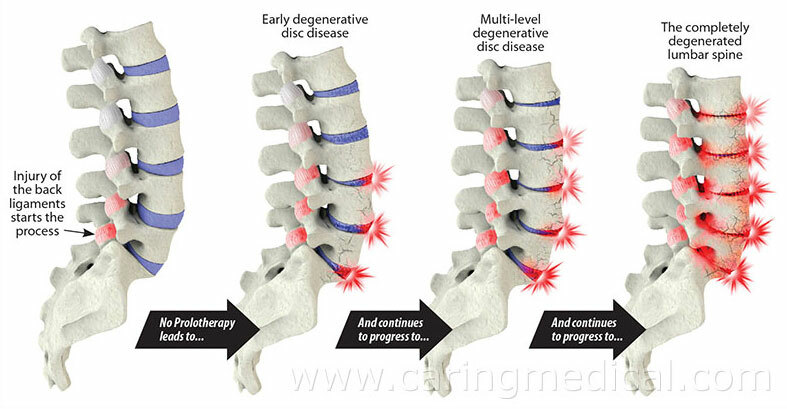 What are realistic alternatives for degenerative disc disease surgery? Controversy surrounding the diagnosis and treatment of Thoracic outlet syndrome | Is it really Thoracic outlet syndrome? Does treating back pain also treat symptoms of anxiety and depression? Resolving sciatica pain with Prolotherapy versus pain "management"
Read about treating back pain with Prolotherapy in our free E-book, Prolo Your Pain Away! Curing Chronic Pain with Prolotherapy, 4th Edition. This edition explains all about Prolotherapy and how it is used to permanently alleviate pain from arthritis, sports injuries, and all types of chronic pain conditions! Plus, it takes an expanded look at the medical literature and patient studies on Regenerative Medicine: Prolotherapy, Platelet Rich Plasma, Stem Cell Therapy, and more! You deserve the best possible results from your back pain treatment. Let’s make this happen! Talk to our team about your case to find out if you are a good candidate.